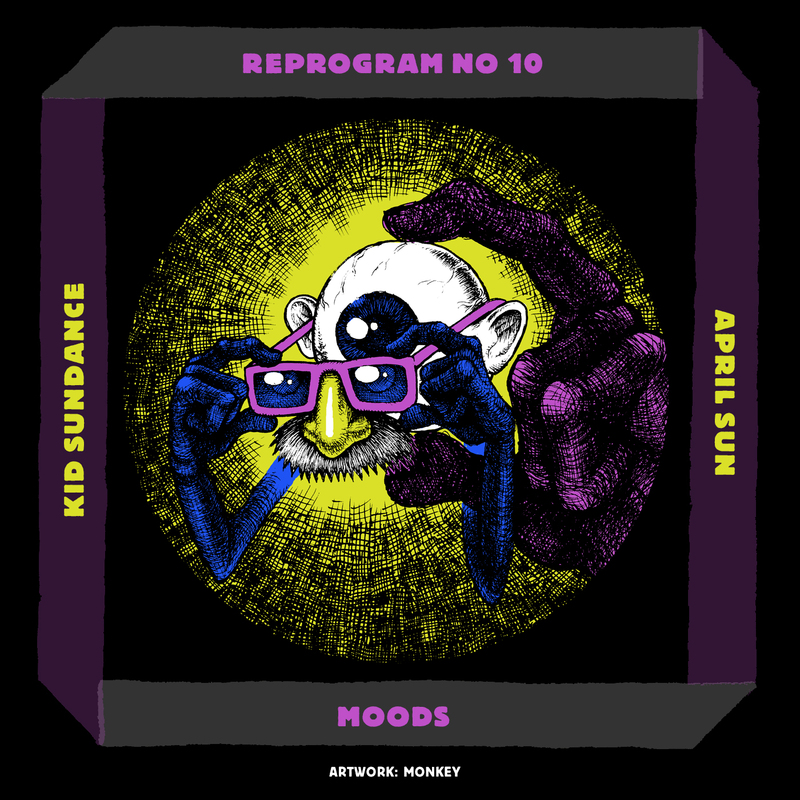 Fremdtunes & Laid Back present the 10th track release of the remix-artwork project ‘REPROGRAM: A SEQUENCE OF REMIXES’: Moods remixed ‘April Sun‘ by Kid Sundance with artwork by Monkey. ‘April Sun‘ appeared on the debut LP Kid’s Colors by Kid Sundance. Sundance has been a household name in the Dutch music-scene for quite some time. He is the founder of Fair Deal Records, co-founder of Boomoperators, remixed work by Ennio Morricone and he collaborated with various artists like Dudley Perkins and Busy Bee. In 2008 he released a single on the great Jazzy Sport label and recently formed the Nu-Boogie group R&R Grooove Xpress with key-player R0nes. His solid, yet experimental, studio-work is characterized by the skillful use of samples, live instruments and vintage machinery. Moods remixed ‘April Sun’ in his own stunning way. He is a beatmaker from Rotterdam (NL); a down-to-earth fellow who has been making much noise in the cloud these past years with crispy, tasteful beats. This youngster continuously marvels marbles and broils tickers around the world with one-of-a-kind, hard-to-resist musical masterpieces. Last year, Moods released ‘Another Point Of View‘, his Fremdtunes debut; emotional, dreamy tunes that reflect the thrills, chills and tingles that life brings about. Berlin-based artist Monkey provides the artwork for the remix. He has a background in graffiti and used to be a member oft the CBS crew. In 2011 he and Aargh founded The PRINTSHOP UNION, a collaborative project. Their collaboration started by painting canvases together but over the years their field of work got wider and now includes objects, installations, performance and video art. Their works often relate to their roles in society, pop culture phenomena, and famous characters. PRINTSHOPUNION.COM is the place where they present their current work and sell their self-made posters and shirts. They strongly believe in high quality handmade limited editions, produced in a fair and eco-friendly way. Yet, they shall be made affordable to audiences outside the art world.